Apply to run with Team JAF at the 2019 Falmouth Road Race on Sunday, August 18, 2019, and raise funds to support New England cancer patients along the way! When Joe and I founded JAF almost 11 years ago, we could hardly have imagined where this journey would take us. We had just been through Joe’s battle with cancer – and, after witnessing first-hand how stressful the entire diagnosis and treatment cycles can be – we came out the other side with a newfound energy and passion for helping others battling the disease. That energy and passion has maintained itself for over a decade for one reason: the patients. We are constantly blown away by the positivity and strength of the patients and family members we have met over the years, and thanks to JAF’s incredibly loyal army of supporters, our foundation has been privileged to provide thousands of financial assistance grants to patients in need. 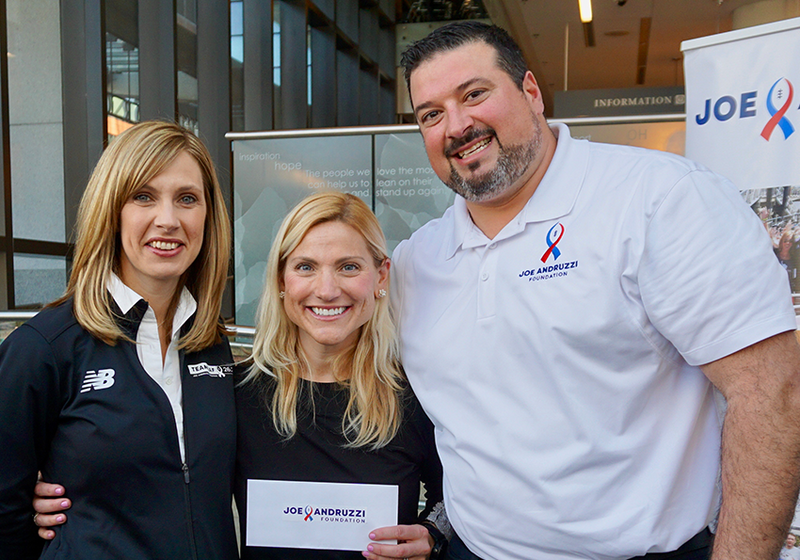 Yesterday, at the Dana-Farber Cancer Institute in Boston, we had the honor of hand-delivering the Joe Andruzzi Foundation’s milestone 10,000th financial assistance grant to Katie Crowell – a strong-willed wife and mother of two beautiful girls, who has fearlessly battled stage IV breast cancer since she was pregnant with her youngest in 2015. If you have not had the chance yet, we urge you to read and learn about Katie’s journey in our latest JAF Patient Story here. Katie had no idea she was JAF’s 10,000th grant recipient, or that Joe and I were on hand to break the news to her and her adorable daughter, Gracie. To us, Katie’s courageous spirit perfectly represents not only JAF’s 10,000th grant, but all 9,999 before it, as well as the next 10,000 in need and beyond. The entire event could not have been possible if not, of course, for our incredible partners at Dana Farber. Thank you for hosting us for the day, and for the support and advocacy you provide for so many JAF-funded patients like Katie each and every year. In the coming weeks, we look forward to sharing more from yesterday’s grant presentation – in the meantime, we urge you to visit our Patient Stories page, where you can learn more about patients like Katie who too have been effected by the financial distress that comes with the hidden costs of cancer. To make a donation in support of JAF cancer patients and their families, please click here.